I saw the news today too and it's pretty awesome! Judging by the creators comments I don't think they'll be hiring Shyamalanadingdong at any time in the future. Judging by box office receipts, 'The Last Airbender' will be the last Airbender. Good riddance to both the movies and M. Night. Will be expecting good things from this sequel. Yeah, their comments about the movie were perfect. Very nice. Since the original guys are doing it, it has potential. It's in the 'Speakeasy' link in the first post. I am pretty happy about this, the creators made a fantastic world that I would be very happy to keep on visiting. Also, it seems they want to test their own mettle. How can future Avatars learn to bend Air if Aang is the last? Most excellent. I'm more excited about this than the return of Futurama even. How can future Avatars learn to bend Air if Aang is the last? With three of the four elements under her belt (Earth, Water, and Fire), Korra seeks to master the final element, Air. Her quest leads her to the epicenter of the modern "Avatar" world, Republic City – a metropolis that is fueled by steampunk technology. It is a virtual melting pot where benders and non-benders from all nations live and thrive. However, Korra discovers that Republic City is plagued by crime as well as a growing anti-bending revolution that threatens to rip it apart. Under the tutelage of Aang's son, Tenzin, Korra begins her airbending training while dealing with the dangers at large. The original series was the inspiration for the Paramount Pictures and Nickelodeon Movies live-action epic adventure, The Last Airbender, which has already grossed more than $115 million at the box office to date. Looks like the first movie's anti-hype was so strong that people couldn't stay away. If the studios are smart, which they're not, they'll either not bother with any more movies or they'll hire someone competent to do the next two movies instead of relying on M. Night to deliver on another movie so terrible that people must see it, since I doubt that same amount of curiosity would be there for a sequel. Very excited for this new show. The fact that technology will play a bigger impact, and that there are anti-bending movements, is an interesting one. The big "win" for technology is of course that it's usable by everybody, whereas bending is an innate talent. It's not clear what percentage of the population can bend, but at the very least there are significant numbers (possibly even a majority). In the aftermath of a world war instigated by firebenders, it's easy to imagine a backlash against bending in general - especially if technology has progressed to the point where at least some tasks normally done by benders are achievable by the general population. It'll also be interesting to see whether the Fire Nation has been severely limited by peace (I'm thinking of Germany after the end of WWI), which could lead to simmering resentment. I was at first stoked to read that the setting of the new series is going to be more stable, but as I'm reviewing TLA I'm not so sure. One of my least favorite stretches has been when they were stuck in Ba Sing Se for five or so episodes. I'm not sure if that's due to the static location or just that specific locale. I thought the whole Ba Sing Se sequence was really interesting. Tales of Ba Sing Se was a great episode. Iroh and Zuko's attempts to assimilate when contrasted with Jet was well done, and Zuko's conflict was pretty important. That episode was quite good, but the city on a whole felt a little out of line. The idea of a puppet monarch and secret police was a little too "real-world" for my taste. 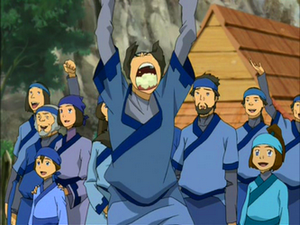 I believe at the end Toph even says how glad she is to be done with the place, and I was quick to agree. Edit: AND! Appa's lost weeks. I can't tell you how much of an impression the scene of Aang's first meeting with Appa left on me. The arc in Ba Sing Se was my favorite part of the series. Different strokes, and all that. It was a good arc, but in some ways it felt like they spelt more time there than they ought to have. I enjoyed the arc myself, but I basically view it as the lesser point of season two except for Appa's journey and the concluding episodes where the plot began moving forward again. Same. The Ba Sing Se arc contains some of the best episodes in the entire series, especially Tales of Ba Sing Se and Appa's Lost Days. In my mind, being that those two were the best episodes detracts from the arc's strength. Tales of Ba Sing Se largely ignores the actual story-important events in favor of nice character-building vignettes, and the majority of Appa's Lost Days did not occur in the city. While grouped in the arc, they are the least relevant to the events there. Tales of Ba Sing Se maybe, but Appa's Lost Days is absolutely integral to the arc. It introduces the Guru, shows the Kyoshi Warriors being defeated by Azula, and establishes that the Dai Lee kidnapped Appa in order to control Aang. It may not take place in the city, but it sets up 3 crucial plot points. Granted. My main and original point is that Ba Sing Se is not a fun place. I hope that Republic City is capable of showcasing the fun spirit of the series. I'm pretty sure Avatar (excluding the god-awful film) is my "Harry Potter", so to speak. I am cautiously optimistic. Sidenote: I cannot possibly describe my disappointment that in the U.S., animation is seen as being a "for kids" thing, and in movies, has almost completely been phased out for CGI. I understand that Anime tries to fill the void, but honestly, me and Anime have been at odds for nearly a decade now. Netflix Instant. All of them.